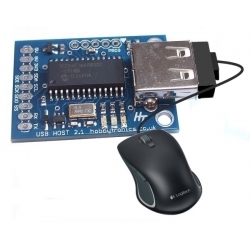 The USB Mouse software for our USB Host board allows you to easily read the raw X and Y mouse movement values, the scroll wheel and all the button inputs from a USB Mouse. Not only that but we have calculated the X and Y coordinates for a virtual mouse cursor position on a configurable "virtual screen". All these values can be easily read into a microcontroller using the serial UART or via I2C. One of the main features of our USB Host Mouse Software is our built-in 'Virtual Screen'. Perhaps you have ideas on using a mouse to position the cursor on an LCD or TFT display. This would be useful if you want to implement a menu system say. Or perhaps you want to control some RC servo's by scrolling the mouse around. Our calculated X and Y positions on a defined virtual screen is exactly what you need for both these options. The Virtual Screen saves you from having to process the raw mouse movement data yourself, and also crucially saves you from having to constantly talk to the mouse to check to see if it has moved. The Virtual Screen is setup using the following parameters, either via the serial RX/TX connection or via I2C. These parameters define the size of the virtual screen, the starting X and Y positions and the sensitivity of the mouse. When the mouse is moved around you will get values for X that are between 0 and 19 and for Y that are between 0 and 3. Just like the mouse on your computer, the X and Y values will not move outside of the virtual screen. This can be used to position a mouse cursor on the LCD screen (see example Arduino program at the bottom of the page). The SPEED setting defaults to 10 which is the maximum setting and uses the full sensitivity of the mouse for changes to the X and Y position. For small displays like the 20x4 LCD in our example, this sensitivity is too fast. Set the SPEED to any value from 1 - 10 to effectively scale the changes. For this LCD, we would recommend it is set to it's minimum value of 1. This requires the mouse to be moved further before the X and Y values are changed. Another example would be controlling servos. Using the Arduino software as an example, servos are controlled by a value between 0 and 180 with 90 being the centre position. If we therefore setup our virtual screen to be 180 x 180, we can use the values directly to control 2 servos. Configuration can be done by sending commands via the serial port. Either by microcontroller or via a terminal program and a suitable serial TTL connection. Commands take effect immediately and are stored in Eeprom on the board. They are automatically loaded at bootup. The Virtual screen configuration can also be set using I2C communication. The following Commands are available to be set via Serial TTL connection. The I2C default address is 41. This can be changed to any value between 1 and 127 using the I2C command. With this option set to its default OFF state, any Virtual Screen setting made using I2C are temporary only and will not be saved and reloaded at bootup. The best way to see what data the mouse is generating, is to monitor the serial output. Data is output in a comma delimited format. Move the mouse around and click each button and note which value changes. This serial transmission is useful for testing and for transmission via a wireless connection. For most uses however we would recommend using the I2C interface. I2C is the recommended method of accessing the data if a hard-wired connection is used, as the comma delimited text string doesn't need to be processed into individual elements. As per normal I2C practice, issue a write command and send the starting register address, then issue a read for the data that you require. Normally this would entail setting the starting address to 0, then reading the full 10 bytes. The configuration settings for the 'Virtual Screen' can also be setup using I2C. This makes it easy to setup options at the beginning of your program. If the option I2CSAVE is set to OFF, then any configuration settings changed with I2C commands are not saved to eeprom. Not all mice are the same, and some are very complex indeed. For instance, mice designed for gaming have many extra buttons and features and come with driver disks. They can have complex USB descriptors and may not work with our software. Standard wired and wireless mice have been tested with this product and should work OK. The following Arduino sketch has the mouse connected to an Arduino UNO and a 20x4 LCD display. Moving the mouse around moves the cursor block. This example code is in the public domain.